Imran Khan said a true “homage” to Vajpayee would be to “resort to the establishment and promotion of peace across the region”. New Delhi: In neighbouring Pakistan, former Indian Prime Minister Atal Bihari Vajpayee’s passing away led to reminisces about his historic bus journey to Lahore, with a not-so-subtle stress on the need for restarting the stalled peace process. Even as Pakistan’s polity is currently focused on setting the stage for the new government, the front pages of the English newspapers Dawn, Express Tribune, The Nation and The News devoted some columns to Vajpayee’s demise. Pakistan’s caretaker law and information minister Ali Zafar led a delegation from Islamabad to attend Vajpayee’s funeral on Friday evening. The Nation had a front-page story in its Friday edition recounting how despite being advised against the visit, Vajpayee had also made a stop at the Minar-i-Pakistan in 1999. The monument in Lahore marks the location where the Lahore Resolution for the creation of Pakistan was adopted in 1940. 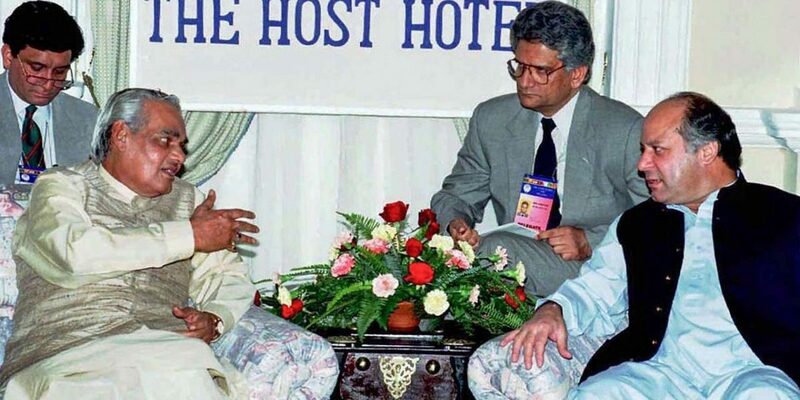 It mentioned Vajpayee’s strong defence of the visit – “I insisted on coming because I saw no logic in what was being told to me and I made it loud and clear to them that Pakistan does not require my stamp for its entity. Pakistan has its own entity”. During the same visit in 1999, Vajpayee had recited his famous couplet exhorting peace among the two countries at a reception. Early on Friday morning, the Pakistan foreign ministry spokesperson tweeted four lines from the poem that calls for the two South Asian rivals abandoning aggression. The nostalgia was especially stark in the messages of PML-N leaders. “While other Indian leaders have talked of peace, but only PM Vajpayee had the vision, will & moral courage to ‘walk the talk’,” tweeted senator Mushahid Hussain Syed, PML-N member of Pakistan’s upper house of parliament. Describing Vajpayee as “an icon of peace who had a Nixonian vision to reach out for building bridges with Pakistan”, Mushahid also posted a photograph of his close association with the historical Lahore visit. With Vajpayee’s host in Lahore, Nawaz Sharif, behind bars, his younger brother Shahbaz Sharif expressed his condolences. “In the death of former PM Atal Bihari Vajpayee, India has lost a leader whose services to regional peace will be remembered for long time,” said the PML-N party president. Referring to their peace initiative, the younger Sharif noted that Vajpayee and his brother had launched a “sincere peace effort” in 1999. “Wish India builds on his legacy by giving peace a chance,” he added. On similar lines, Pakistan’s newest premier Imran Khan used the opportunity to reiterate his call for peace talks with India. A statement issued by his party, Pakistan Tehreek-e-Insaaf (PTI), on behalf of Khan on Thursday said that there could be political differences between the two countries, but the desire to establish peace exists on both sides of the border. He asserted that a “homage” to Vajpayee would be to “resort to the establishment and promotion of peace across the region”. The opposition Pakistan People’s Party (PPP) leader Sherry Rehman tweeted that Vajpayee had been “gracious and sincere” about attempting to ease visa regimes for senior citizens when she had met him in New Delhi. “That was another era, another BJP though,” she added. Vajpayee’s Lahore visit had been pathbreaking as it took place less than a year after India and Pakistan conducted nuclear tests. Then Pakistan army chief Pervez Musharraf refused to attend the ceremonial welcome of the maiden bus trip at Wagah – and within a few months, he was spearheading the Kargil intrusion in the summer. Later, Musharraf would travel to India as Pakistan president after he deposed Nawaz Sharif in a coup. But the 2001 Agra summit collapsed with allegations of bad faith by both sides. In an interview to an Indian news channel WION on Thursday night, Musharraf said, “He was a great man, and it is a great loss. India and Pakistan should both feel the great loss of the towering personality of Mr Vajpayee”. Vajpayee travelled to Pakistan again for the SAARC summit in January 2004. On the sidelines in Islamabad, he met with Musharraf and issued a joint press statement. This document has become a significant arsenal in Indian diplomatic arguments, as the press release notes that Musharraf assured Vajpayee that Pakistani territory will not support terrorism “in any manner”. While Vajpayee’s Lahore bus journey is his most famous Pakistani sojourn, he had made an equally memorable equation during his visit trip to Pakistan in February 1978. As a 55-year-old foreign minister in the Moraji Desai government, Vajpayee had a more sceptical audience in Islamabad, especially due to his background. As a Jana Sangh member, Vajpayee had opposed the Simla accord signed between Indira Gandhi and Zulfikar Ali Bhutto. But as foreign minister, he repudiated those views publicly, with Vajpayee apparently describing them as “minority views” of the Jana Sangh which became superfluous after accepting the Janata manifesto. The Pakistanis were delighted that Vajpayee’s visit had gone off without a hitch. Nineteen years before the Lahore bus trip, Vajpayee had also charmed his hosts by using an appropriate couplet by Pakstani poet laureate Iqbal. Credit should also be given to Vajpayee who knew he (and the jana sangh) had a reputation to live down here and whose performance in doing so had a warm human touch best designed to please his audience; his use of Iqbal quotations about the need for “change” did not hurt either. A few months later, Vajpayee offered to sponsor Pakistan’s membership in the Non-Aligned Movement (NAM) if Islamabad left ‘CENTO’. In 1979, CENTO was dissolved and Pakistan became a full NAM member.